I just realized I never finished the draft I had started of my race report from 2018. I’ve included that original draft at the end of this post after the 2019 race recap. Here is my finish line picture above that Brent took from both years. The left one is this year’s where the massive thunderstorms turned a nice evening into a very cold, wet one. I am literally wearing my emergency sleeping bivy like a toga underneath my jersey. In 2018, it was also quite wet, but also much colder. I didn’t have the winter weather gear with me that you needed so I stopped at a Family Dollar and bought whatever I could find — including oven mitts for long finger gloves!!! This was the toughest skyway yet, here’s quick recap – nice overnight temps to stay in the lower 50s (but of course it dropped into the 40s). Dry weather expected until Saturday afternoon when stray thunderstorms possible. It turned into a beautiful, warm day eventually but stayed perfectly cool for most of the day because of overcast skies. This was important to help manage water, if we ever get a blistering hot skyway, then you will be filtering water at nearly every water source you come to. 10 of us started the race Friday night at 10pm. I got the hole shot to the singletrack and pushed the pace hard for a long time wanting to lead the race from start to finish again this year. 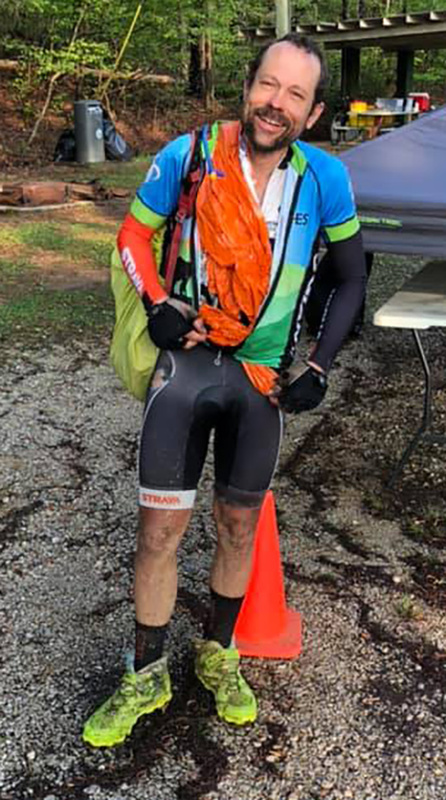 I knew that other people had better singletrack skills so I wanted to push it hard while hopefully the more skilled riders were cruising, conserving energy for the long race ahead. I ended up with almost a 10 minute lead coming out of the single track and hitting the Wiregrass dirt road. Lots and lots of ups and downs. I was conservative with lights because I didn’t bring a wall plug for charging anything and was relying on my beefy 15,000 mAh battery pack to keep everything charged. 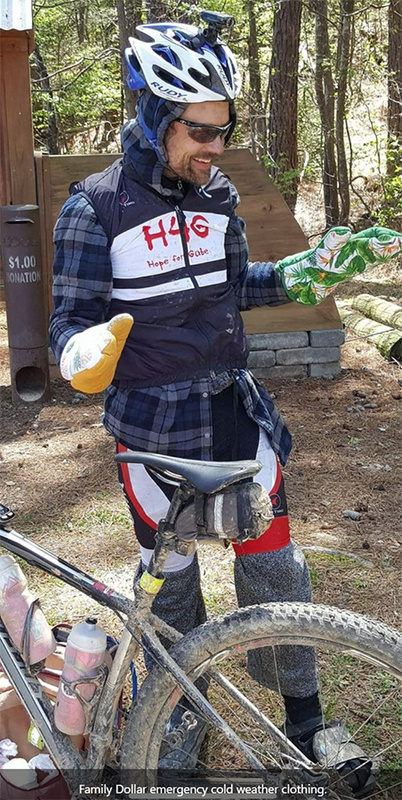 I ran both lights for the entire opening 11 miles of singletrack – a 750 lumen handlebar mounted light on its lowest setting (200 lumens), and my 550 lumen helmet light on its lowest setting (125 lumens). As soon as I hit wiregrass, I switched to the helmet one only on its lowest setting. I’d actually preferred to use the handlebar mounted one, but my helmet one was “iffy” in being able to turn it off because of quite the soaking in rain on one ride. So while it was working, I wanted to exhaust it and save my nicer 750 lumen light for when the first one unexpectedly stopped working or got stuck in high mode running the battery down quickly. This entry was posted in Adventure, Racing on April 10, 2019 by kartoone.